How do you seal an SUVs place as the mud-slinging, trail-loving, handle-anything SUV? Bring in thrill seeker Rush Sturges. Create excitement and social engagement for new and old 4Runner fans. 4Runner fans aren’t just car people, they’re adventurists who take pride in pushing their SUV-adventures to the limits. This kind of community speaks to my southern roots, and we found an influencer who embodied their die-hard lifestyle. With filmmaker and pro-whitewater rafter Rush Sturges, we created buzz around #KeepitWild, a call-to-adventure to new and old 4Runner fans. And boy, did people respond. More than 1,000,000 YouTube hits. 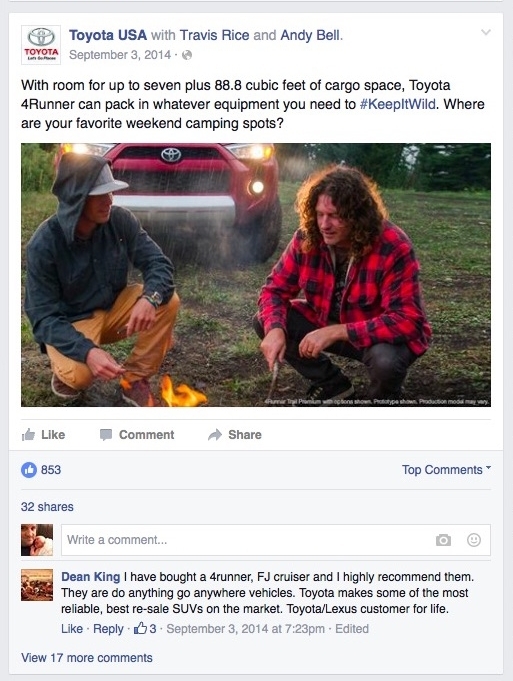 Tens of thousands of 4Runner owners hashtagged hundreds of pictures of their adventure-ridden 4Runners.